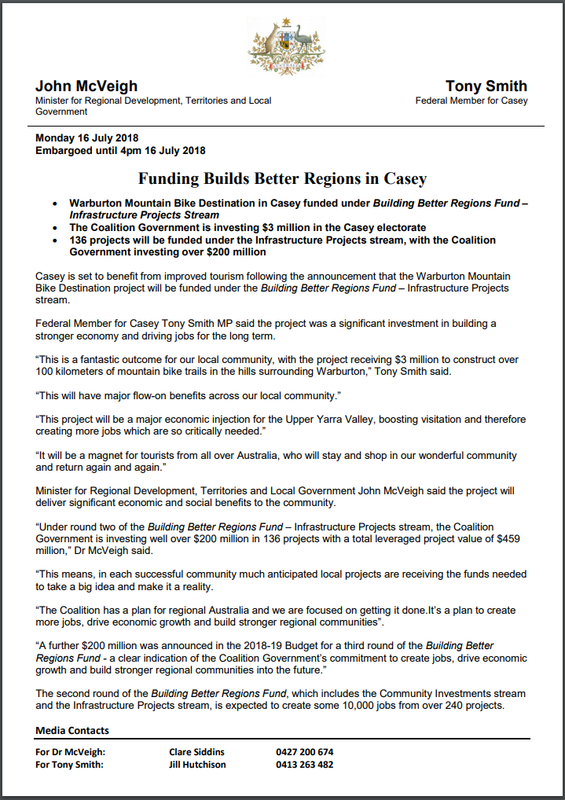 After 10 years of lobbying in support of a mountain bike network in and around Warburton, the Committee of Yarra Ranges Mountain Bikers are ecstatic to announce that the Federal Government, via the Building Better Regions Fund, have committed $3 Million to kick start the project. Upper Yarra Community Enterprise, the Warburton and Yarra Junction Community Bank branches have also committed $300,000 to the project. With $6,000,000 phase one of the project, which includes 100KM of trail, including 'Drop a K', is officially funded. Council applied for the federal funding in response to demand for recreation activities, to stimulate tourism and deliver environmental, economic and social benefits to the community by creating job security. It is estimated that the project will inject $20.4 million annually into the local economy. If you haven't already, have your say in the shape of the trails via Engage Vic. Responses due by 24th July. Thank you all for your efforts, support and encouragement. The dream is becoming a reality! !